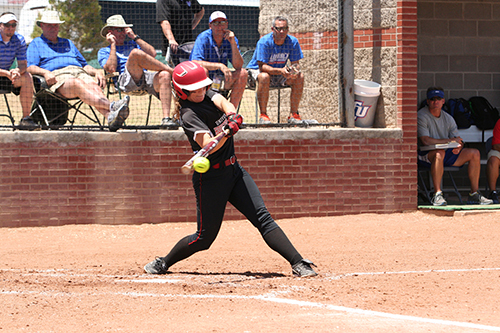 UHV senior Marley Moehrig competes in the 2013 NAIA National Championships Opening Round in Lubbock. Moehrig, who graduated with an MBA from UHV in 2016, recently was named head coach of the Victoria St. Joseph Lady Flyers softball team. UHV graduate Marley Moehrig left her mark on the University of Houston-Victoria softball record book five years ago. Now, Moehrig is taking that success to the high school field where she serves as head coach of the Victoria St. Joseph Lady Flyers softball team. Moehrig, who received both her Master of Business Administration in 2016 and her bachelor’s degree in 2013 from UHV, was named the team’s head coach this season after helping coach the team two years ago. “The position opened up, and the athletics director called me, and we interviewed, and here I am,” Moehrig said. The position is a part-time job for Moehrig, who serves as a senior accountant for Regency Integrated Health Services, where she has been employed for the past five years. Moehrig had a spectacular career with the UHV Jaguars, earning NAIA and NFCA All-American first-team honors her junior season, while rewriting much of the UHV softball record book. She still holds UHV career single-season records for runs batted in (78), slugging percentage (0.847), total bases (144) and triples (7), and shares the single-season record for home runs at 15. She also holds the UHV career record for runs batted in (196), triples (14), home runs (34) and total bases (356). The former third baseman also is second in career multi-hit games with 50 during her 2011-2014 career. She was named the Association of Independent Institution Conference Player of the Year in 2013, was all-region in 2013 and 2014, and her teams made three NAIA National Championship appearances during her four years with the Jaguars. She was named the UHV Female Athlete of the Year in 2013. She also played two weeks in Europe as a member of a collegiate select team. Now, Moehrig is trying to use the lessons she learned on the field from her coach Keri Lambeth and her teammates to guide the Lady Flyers. Moehrig says she has tried to incorporate many of the drills and experiences into the Lady Flyers’ practices and game plans. “I have incorporated a lot of what we did into our system, and I know I have to make adjustments here and there so that I can come up with the right system that will help the girls,” she said. But learning the game is not the only thing Moehrig hopes to instill in her players during the course of the season. She also wants them to focus on their education. “I want the girls to learn about life’s lessons and that school is more important than softball. You are a student-athlete first, and this is just something you get to do with your friends and have fun with,” said Moehrig. There’s no doubt she will have her team battling for the district championship and a shot at a playoff run in no time.